According to reliable reports from inside the Iranian regime and documents obtained by the Iranian Resistance, suppression of PMOI in Camp Liberty and the fate of the seven Ashraf hostages and their extradition to the religious fascism ruling Iran are among the most important topics of discussion between Maliki and the clerical regime in Maliki’s visit to Tehran. Maliki’s principal objective in this trip following his failed visit to United States and after mullahs’ regime nuclear agreement in Geneva, is to secure mullahs’ regime full support to keep his post as Iraq’s prime minister for the third consecutive round. This is while the Iraqi people and political currents in this country, including Maliki’s closest coalitions, are against renewal of his Prime Ministry. Extensive opposition in the U.S. House, Senate and public opinion to Maliki’s atrocities, has made U.S. government’s support for continuation of his Prime Ministry still more difficult. 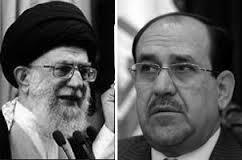 In fact, Maliki is going to Tehran to receive Khamenei’s endorsement for his third term as Prime Minister from the bloodthirsty religious dictatorship by resorting to daily bombings, explosions and murders in Iraq. In such a situation, suppression of the Iranian opposition in Iraq and the fate of the seven Ashraf hostages are of paramount importance. Maliki needs to reassure the Velayat-e faqih regime of continuation and intensification of restrictions and suppression of Camp Liberty residents and if necessary to handover the hostages to the Iranian regime. Given repeated and written commitments of United Nations and the U.S. government regarding safety and security of residents of Ashraf and Camp Liberty, the Iranian Resistance calls on the U.S. President and Secretary of State and the UN Secretary-General to immediately compel the Iraqi government to free the hostages and to prevent their extradition to the Iranian regime that will result in their torture and execution. United States and United Nations have direct responsibility for any harm to the seven Ashraf hostages. Hunger strike by Iranians in various countries around the globe to secure the release of the hostages and ensure security of Camp Liberty has now entered its fourth month.